Celebrate on the S.S. Badger carferry by taking one...or all five...shoreline cruises this year. It's a guaranteed fun time for all! If you've never taken a trip across Lake Michigan aboard the S.S. Badger, start small and take a Shoreline Cruise! Five of these fun excursions are planned for this summer, each one lasting two hours. It's time to join in the festivities and celebrate this grand ship. For all cruises, tickets are non-refundable but are transferable. The ticket price does not include the security fee. Kids under five are always free. No passes will be accepted for the shoreline cruises, and they go on rain or shine. Tickets must be purchased in advance by stopping in at the Manitowoc or Ludington ticket offices or by calling (800) 841-4243. Passengers (or pirates!) can board the S.S. Badger June 1 at 1:30pm and the ship will cruise the Manitowoc shoreline from 2-4pm (CT). The $42 ticket price includes the Badger Party Buffet with desserts and soft drinks. Two cash bars will be available with drink specials. Space is limited and event sells out fast. You can purchase tickets online, call (800) 841-4243 after March 18, or stop into the Manitowoc Ticket Office after May 6. Dress in your favorite 50s rock or 50s vintage dress attire. This cruise will transport you back to 1953...the year the S.S. Badger set sail. Passengers board at 8:30pm and the Badger will cruise the Ludington shoreline from 9-11pm. Ticket price of $42 includes the Badger Party Buffet with desserts and soft drinks. Two cash bars will be available. Space is limited and this cruise typically sells out weeks in advance. Tickets are available online, by phone after March 18 (800) 841-4243, or stop by the Ludington Ticket Office after May 6. This annual July 4th cruise is popular because it gives you a spectacular view of the fireworks. Passengers board at 8:30pm and cruise starts at 9pm. 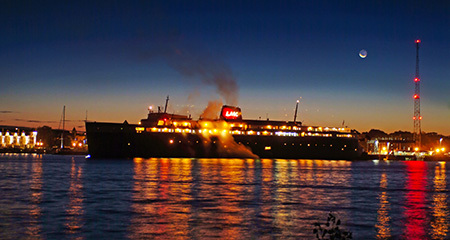 The S.S. Badger will cruise along the Ludington shoreline until sunset, then get into position outside the breakwall just in time to experience the fabulous fireworks display. Ticket prices are $52 per person and includes the all-you-can-eat Badger Picnic Buffet with desserts and soft drinks. Two cash bars will be available with drink specials. Space is limited. Tickets are available online, by phone after March 18 (800) 841-4243, or stop by the Ludington Ticket Office after May 6. Get out your tropical attire and enjoy this cruise with a Caribbean theme. Cruise is from 9-11pm. Ticket prices are $42 per person and includes the all-you-can-eat Badger Picnic Buffet with desserts and soft drinks. Two cash bars will be available with drink specials. Space is limited. Tickets are available online, by phone after March 18 (800) 841-4243, or stop by the Ludington Ticket Office after May 6. Say goodbye to summer with this shoreline cruise in Ludington. Passengers board the ship at 8:30pm and the Badger will cruise the shoreline from 9-11pm. The $42 ticket price includes the all-you-can-eat Badger Party Buffet, desserts and soft drinks Two cash bars will be available with drink specials. Space is limited. Tickets are available online, by phone after March 18 (800) 841-4243, or stop by the Ludington Ticket Office after May 6. Ludington is a top vacation destination in Michigan...due to the miles of beautiful beaches, first class fishing and the Ludington State Park. The S.S. Badger docks just a few short blocks from Ludington's vibrant downtown, filled with great shops, restaurants and galleries...or visit one of our historic lighthouses. Ludington has plenty of lodging facilities, from hotels/motels and resorts to charming bed & breakfasts. Any time of year, there's a fun event happening in the area. Manitowoc is a community of roughly 35,000 and rich in maritime history and is the lone Wisconsin port for the S.S. Badger carferry. Manitowoc was ranked #2 by Forbes Magazine for "Best Small Cities to Raise a Family." The downtown area is within walking distance of the carferry port where you can shop, catch a movie or dine in one of the local restaurants. Enjoy a leisurely bike ride or hike on the Mariner's Trail, a seven mile trail that runs along Lake Michigan. There are numerous other things to do in and around the Manitowoc area.